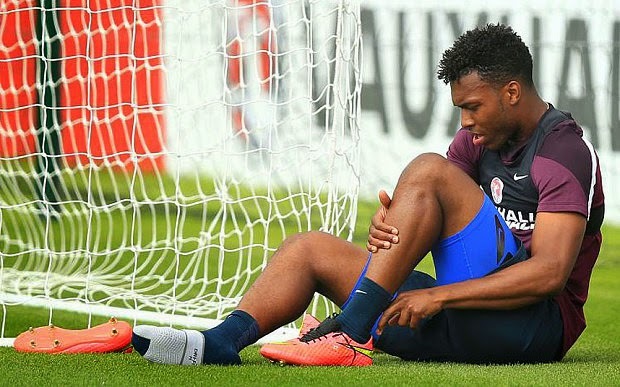 Brendan Rodgers, Liverpool’s manager has directed criticism towards the treatment of England with Daniel Sturridge after he was ruled out with a thigh problem for up to three weeks. It was during a training session on Friday at St George’s Park that the 25-year-old striker got injured. The session was conducted 36 hours after he had participated in the friendly match against Norway that had lasted for 89 minutes. Roy Hodgson, England’s boss was preparing his players for the opening of the 2016 Euro qualifier on Monday in Switzerland. However, it was claimed by Rodgers that Sturridge would have been given some additional time for recovery in a similar situation if he had been with his club. Rodgers further suggested that individual needs weren’t considered sufficiently in the national setup. The Reds boss said that the injury would take three weeks to recover and this is highly disappointing because it could have been avoided completely. He said that Emre Can had returned from the Under 21s in Germany with an ankle injury that would probably keep him out for nearly six weeks. He said that Joe Allen was suffering from an issue with his knee because he had played on an artificial pitch that was awful. In his opinion, these things are unfortunate, but are a part of the game. However, where Daniel’s situation is concerned, he is a dynamic and fast player and has individualized recovery time just like every other player. The major disappointment is that he wouldn’t have been called for training and would have been allowed to recover. This way, he could have avoided a thigh injury altogether. He asserted that players like Daniel have different recovery times and it wasn’t possible to blanket them all. This means that one recovery time isn’t suitable for all players because they are all different. The manager further said that in the case of Luis Suarez, on the second day of his active recovery, he would require some extra work and they were more than happy to have him. Thus, it is important to consider the individual player because everyone is completely different. He expressed the hope that they would be able to improve communication in the future as they are focused on maximizing the playing ability of a player. He said that the striker had been outstanding against Tottenham and they had lost him for three weeks because of an injury that could have been prevented altogether. Hodgson wasn’t directly blamed by Rodgers because he believed that the backroom team of the England manager also made a significant contribution to the decision. Nonetheless, this isn’t the first time that he has been happy with the treatment of Sturridge by the national team. Last November, the manager had made the striker play for 90 minutes in a friendly against the Germans even though he had complained of a thigh problem that had caused him to sit out on two World Cup qualifiers. Hodgson had said that he was ‘testing his resolve’. The post has been written by Brandon Smith who writes for BroadcastingLiveSports.com, a website where sports lovers can watch live sports and stay updated with the progress of their favorite games.